I finally completed the Time Warp Quilt! You can thank in part, the Superbowl as I found hand-sewing the binding on to be much more interesting than the game. I finished sewing on the rest of it a little bit at a time through out this week. I finished it late Wednesday night, but it's just so gloomy outside that it hard to get any good pictures thus far so I finally decided to tack it up on my wall on my porch for a quick photo op! I used a couple of Moda Scrap bags of 30's reproduction prints that was released about 3 years ago. For the back I used this delicious peach bubble fabric, which was also used for the binding. 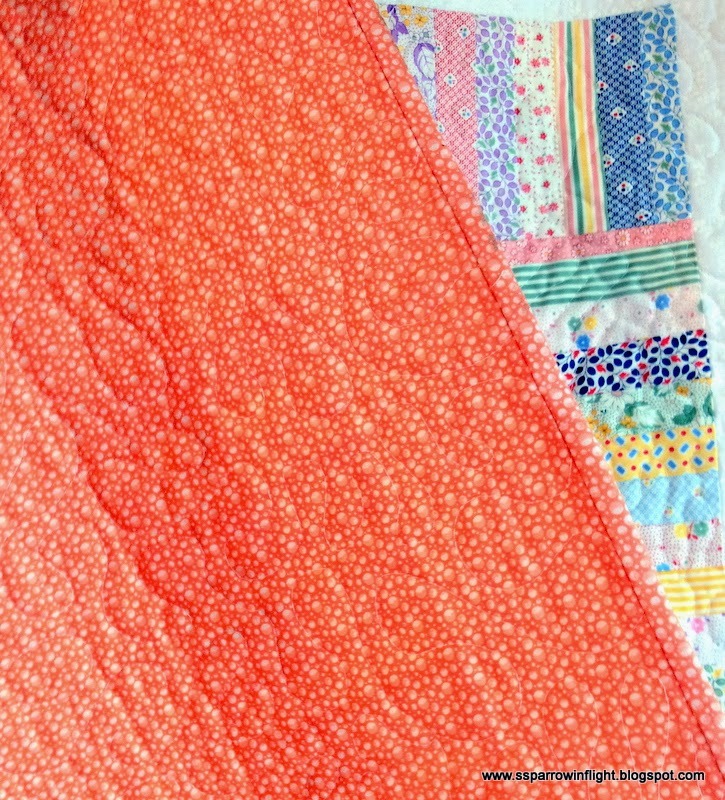 It finishes out at 55" X 50" and works well for either a lap blanket or a large floor quilt for the littles. It currently is hiding so Miss Z doesn't try to claim this one as well! I was so pleased to use more of my stashed fabrics instead of running off to purchase more. I do have to warn you that I am quite low on cream and white background or low volume prints. I have just signed up to do a block swap which promises to deplete much of my left overs so I will need to get some more of that in the stash. I am also a part of a traveling quilt group which starts up in a week or so! So much to do and I don't want to let anyone done on all those things I have signed up for. I also gave 5.5 yards of fabric away over the past 4 weeks; I wasn't sure if I should include in the totals, but I finally did decide to add since it left my home. 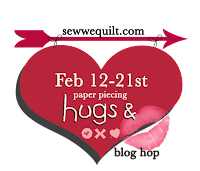 Don't forget to to visit those participating in the Hugs & Kisses Blog Hop with Sew We Quilt (It starts this coming week)!! 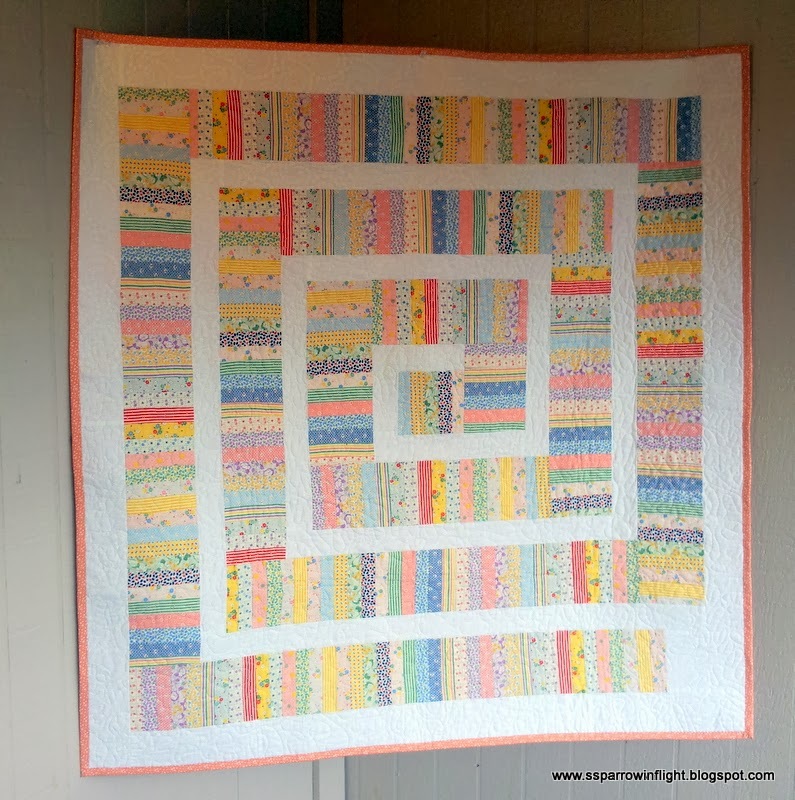 Love all the pretty colors in that quilt!